“The ability to connect the dots for end to end solutions across the boundaries of people, process and systems is the key to success"
Continuous Improvement is not just something a Lean Six Sigma (LSS) practitioner leads their organization in practicing, but is also a core competency of their professional makeup. That is why more and more innovative and leading companies are looking for leaders that use the LSS way of thinking in everything they do within their organization. In this era of data science and machine learning, the ability to connect the dots for end to end solutions across the boundaries of people, process and systems is the key to success. This year’s conference is focused on making sure we are “continuing” our journey as practitioners. Whatever your level of experience, you will learn new concepts, new perspectives and network with the best in the industry. 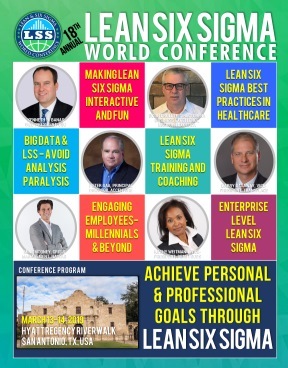 I am looking forward to meeting and exchanging great ideas with all the speakers and attendees in beautiful San Antonio, TX in March, 2019.